On the 15 May 1884 the first Salon des Artistes Indépendants opened in the courtyard of the Tuileries. This was a momentous event for the art world enabling young artists to exhibit their work without having to submit canvasses to the ultra-conservative jury of the official Salon. Seurat had submitted Bathers at Asnières for the official Salon but it was predictably rejected. The painting was now exhibited at this alternative forum and although it was rather disappointingly displayed (in the bar) it was noticed by the critics and received some charitable if occasionally somewhat puzzled reviews. Among those who were highly impressed with the work was Paul Signac, who first met Seurat at this inaugural Indépendants, along with future Neo-Impressionists Charles Angrand, Henri Edmond Cross and Albert Dubois-Pillet. The picture captures those stultifying moments we all experience on a hot summer afternoon. There are occasional cooling flurries of wind — the flag on the ferry hangs limply but there seems to be enough breeze to fill the sails of the larger sailing craft that populate the river, and the smoke from a nearby factory is carried away from the perpendicular. 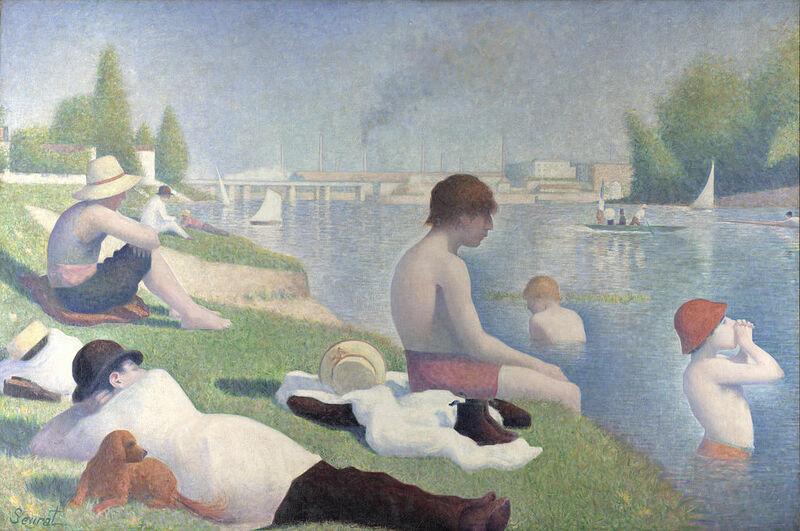 But the heat is palpable; Seurat has perfectly captured the visible by-products of the high temperature — the trees in the middle distance dance and shimmer in the sunlight; the haze unites the sky and river in a blur of light; the white clothing, either worn or discarded on the bank dazzles us with reflected light; the occasional dark shadow points up the slightly faded colour of the grass in the intense sunlight. The bathers in the water and the flaneurs on the bank are caught in a mid-summer ennui, each absorbed in their own reverie, contemplating the river but seemingly unable to break a heat-imposed trance. Unlike most of his Impressionist contemporaries, Seurat did not achieve these effects by setting up his easel out of doors and creating the finished work en plein air. Apart from anything else the monumental size of the canvas, at over three metres wide, would preclude any such thought. Instead he worked slowly and painstakingly in the studio putting together the finished composition with the help of a considerable number of drawings and oil studies on panel, many of which were executed in situ. Seurat was therefore working more in the tradition of Poussin and, in particular that immensely influential contemporary, Pierre Puvis de Chavannes, a similarity which was noted by contemporary critics. The Bathers has that feeling of compositional rigour which you would expect from Poussin and Puvis, but although Seurat is using the same visual grammar, he departs from their Arcadian dreamscapes, transplanting the ‘lower orders’ in place of the semi-heroic beings which inhabit Puvis’s universe. In this he was at one with the Impressionists. Seurat famously developed a working method later called pointillism (he preferred the rather clumsy label chromo-luminarism) based on his extensive researches into colour theory which led him to study optics, chemistry and other scientific disciplines. Essentially, and without going into great detail, his method involved the application of juxtaposed dabs of pure but complementary colour which when viewed from a distance fused and mixed within the spectator’s eye. Bathers at Asnières is an early piece in which full-blown pointillism is not used to any great extent. Instead, Seurat uses a number of techniques from bold brush strokes to cross-hatching (especially in depicting the grass) but the actual method matters less than the fact that in the Bathers his colour combinations conform to his theories of colour harmony. He added some pointillist detail later, especially in the orange hat worn by the boy blowing into cupped hands, where small dots of yellow, lighter orange and dark blue (reflecting the water) resonate and complement each other.